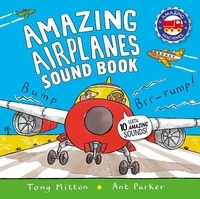 Amazing Airplanes Sound Book is a fantastic addition to the bestselling Amazing Machines range. The perennially popular picture book is now available for the first time in this exciting new format. Young children will love hearing the roar of the plane's engines, the sounds of the airport, the pilot in his cockpit, and much more, discovering new sounds on every spread. The Amazing Machines picture books feature zippy wordplay and zappy art, perfect for entertaining mini motorheads. The much-loved animal characters that feature throughout the series return in this book as they arrive at the airport ready to board their plane.